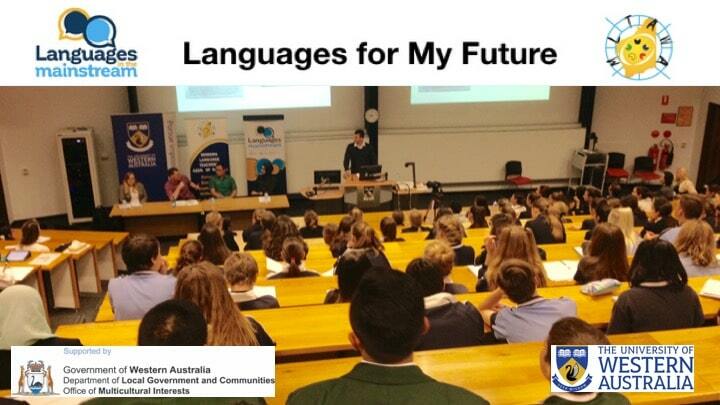 On the 9th of May, Year 10 Languages students were given the opportunity to attend: “Language For My Future at UWA.” The presentation was very informative and it truly was a worthwhile experience. There were representatives of universities, university students and also lecturers, who discussed the benefits and skills gained by choosing to further your languagestudies in university. We were fortunate enough to gain an insight in to what learning a language would be like with current students talking about their personal experiences. Their passion for languages encouraged myself and my peers to realise the benefits of being bi-lingual in today’s society. It helped us to develop a broader understanding of the advantages of languages that most of us were unaware of. All in all, Language for My Future certainly widened our understanding and knowledge about studying language in Years 11 and 12 and at University. It was a valuable and advantageous experience for everyone! (By Ramudhi). My trip to UWA was great. Listening to the students’ experiences allowed me to think about what I want to do and widened my options. The information about the LOTE Bonus for university entrance was useful to know. The presentation was also well organised and comfortable. My favourite part about the presentation was when the four students were being asked questions about their language learning journey. The reason for this is because I could relate to a lot of what they said about getting into languages. Something else that I noticed was that I usually don’t like sitting in one spot for long periods of time. However, for the entire presentation, I was intrigued and interested, which took my mind off the fact that I was sitting for almost two hours. Thank you for the experience! (By Shiavux). For those who were unable to attend the forum, we have recorded the first part involving the panel discussion and welcome by Prof Alexandra Ludewig, Head of Humanities at the University of Western Australia. We sincerely thank the many people representing the following organisations for taking part and supporting this event: University of Western Australia, Tertiary Institution Services Centre, School Curriculum and Standards Authority, Murdoch University, North Metropolitan TAFE and Edith Cowan University. A very big thank you to Dr Marinella Caruso, Sabine Kuuse and Karen Gregory for coordinating the event.